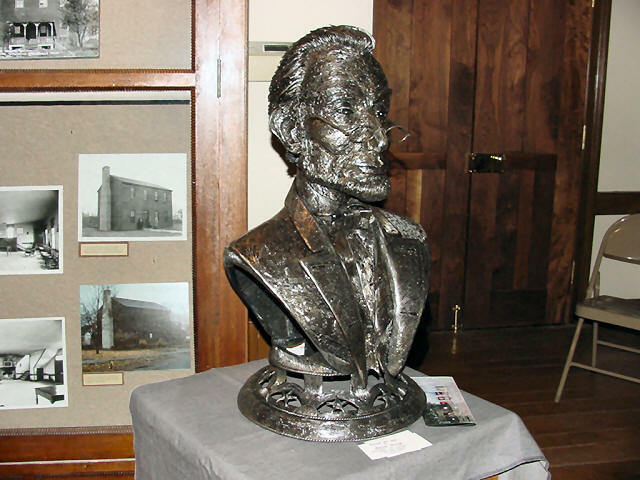 [NOV. 15, 2005] Visitors' eyes popped and jaws dropped on first seeing the new sculpture of Abraham Lincoln at the Postville Courthouse. The stunning metal bust captivated visitors during an open house in honor of artist Glenn Busch on Nov. 6. Postville was the first Logan County Courthouse and was a site where the prairie lawyer Abraham Lincoln often practiced law. What more fitting place to introduce this unique rendering of America's most famous president, Abraham Lincoln? Busch, of Azle, Texas, received a bachelor's degree in fine arts from Texas Tech in Lubbock. 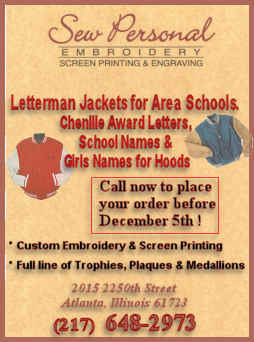 While trained in all art media, he has mostly stayed with his high school favorite, 3-D art forms. His professional work has been in sculpture, ceramics, watercolors and jewelry, but of all the media, he loves to work with metal the most. He likes his sculpture subjects to portray energy and action. The strength of metal serves as the most useful medium to achieve the sense of real lifelike movement. 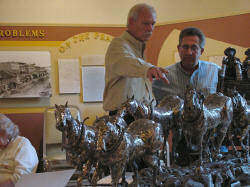 Artist Glenn Busch (left) explains to an open house visitor how he will complete his most recent work. The bust of Lincoln is completely created from baling wire. He begins by drawing the basic form of a sculpture. Then he makes a wire form. After that, baling wire is meticulously applied over the form, using an acetylene torch. The final product receives a surface treatment. Busch also brought some of his other work to show. The artist had his current work-in-progress on display for the open house. Figures in a horse-drawn coach appear to be bracing themselves as the coach tumbles over sharp rocky terrain, while strong-looking horses canter full into the movement. Busch is down to the last touches on the sculpture. The addition of the final details, such as the drape or tautness of the reins and angles of the other horse accouterments, will further enhance the evidence of movement, he explained. A horseman himself, Busch knows how to bring out the magnificent power and strength of a workhorse in action through careful attention to the animal's musculature and leg positions. He says that metal has been his favorite medium in creating the action-based sculptures that he designs, as it affords the strength to support larger portions, such as a horse in movement might have only one foot touching the ground. Ceramics and other materials won't do that; they break, he says. Busch has met his goal with this all-metal sculpture. It truly reflects his passion to show energy and movement, as you would see in real life. While working on the coach-and-horses piece he has produced four other pieces, Busch said, one of which is a crown of thorns that is on display at the First Presbyterian Church on Pekin Street. Comments heard about this piece include, "Gorgeous." It can be seen at the church Monday through Friday from 8 a.m. to 1 p.m. He has enjoyed creating a number of Crucifixion-based pieces that include crosses and other crowns. Busch was joined at the open house by his parents, Ed and Rose Busch of Lincoln. Glenn Busch was born in Lincoln, but his family moved to Texas when he was 2. His parents returned to Lincoln 25 years ago. His mother was Rose Glenn of Middletown before she married. The metal bust will be on view at the Postville Courthouse until the end of November. Postville is open Tuesday through Saturday from noon to 4 p.m. and by appointment. You can schedule an appointment of special group tour by calling Shirley Bartelmay at (217) 735-4977.